SABA advises that from the week commencing 6 May for approximately 3 weeks, portions of the car park at Lockleys will be cordoned off whilst new underground pipework is installed by the council. Where: At the WA Satterley Hall, 42 Rutland Avenue, Lockleys SA. Download event details (form updated 15/04/2019) here. Entries close: Saturday 20th April 2019. Just a quick reminder that our club AGM will be held Friday 29th March at Seymour College. Meeting will start at 7:30 but courts and shuttles will be available from 6:30 pm for hits before and after the meeting. We do need members to turn up so have quorum and also don't forget you get a discount for registering at the AGM. Hope to see you all there! Entries for the upcoming Sturt Handicap are now open. This event will be held on Sunday March 17th from 1pm at WA Satterley Hall (Lockleys). Entries close Wednesday 13th March but there are limited spots so enter/let Simon know as soon as can if wish to play. Download entry details here. Event details here. Entries close Saturday February 23rd - entry form here. A few months ago Sturt had the opportunity to work with Channel 11 Totally Wild crew to promote badminton. The segment was shown on TV today, 10th November, and is now available on the Totally Wild website. Check us out here! https://tenplay.com.au/channel-eleven/totally-wild. Season 25 episode 130 - our badminton segment starts at 12 minutes 45 seconds. At the end of every year the Sturt Badminton Club holds a lunch to celebrate badminton and enjoy socialising with our members and their friends and families. Whether you are in your first year of joining the club, have been with the club for some time now or no longer play but just want to keep in touch, this event will provide a great opportunity to have everyone come together for an end-of-year celebration. There will be presentations and awards on the day. Sturt is subsidising tickets - cost to purchase per person is $15 which covers one main meal, a selection of breads to start and fresh tossed garden salads to share. · Tickets need to be purchased by 5 pm Friday November 30th for catering purposes. There are limited places. · No refunds will be given. If you are unable to attend after purchasing your ticket you are welcome to approach other club members to ensure your ticket is put to good use. · You will need to purchase your own drinks on the day. No BYO. Paul has been appointed the South Australian Under 17 and Under 19 State Coach. Let Paul know if you want to attend training. Under 17 tryouts are Saturday 17th 12:00 -2:00 pm at Locklleys $10 per session. Teams will be selected next year for the Under 17 event in Adelaide. Under 19 training start 8th December 2018. Contact Paul with any questions. 24th and 25th November 2018. Entries close 21st November 2018. Download details here . Download the entry form here. Some Sturt members participated in filming for a Channel Ten Totally Wild segment that will be included in the episode TW25/130 which is going to air on Saturday, 10 November 2018 at 8:30 am on channel Eleven. Thanks to those who volunteered! To be held on Saturday 25th August and Sunday 26th August, at the WA Satterley Hall, 42 Rutland Avenue, Lockleys SA. Download event details here. Entries close: Wednesday 22nd August 5 pm. Badminton SA will be providing a Shuttletime course on the 22nd of September at 9:00am at WA Satterley Hall, Lockleys. It is ten-pin bowling time! Two games for $10 per club member. Family and friends are invited. RSVP to Simon by 6th August. Download details of this social event here. 2nd & 3rd June 2018. Entries close Wednesday 23rd May. Download event details here and entry details here. **Reminder** this is an U19 State Team selection tournament. B and C Grade event 19th and 20th May 2018. Entries close Wednesday 16th May. Download event and entry details here. Open and A Grade event 27th and 28th April 2018. Applications close 26th April 2018. Download application and event details here. Applications close 27th April 2018. Download application and event details here. Event 28th Sept to 4th October 2018 Wharoonga NSW. 21st & 22nd April 2018 . Entries close: Wednesday 18th April. The 2018 CROWN GROUP Australian Badminton Open is offering registered members of Badminton Australia to receive 20% off tickets to the event purchased before 1st April. The coupon code for our state can be used when purchasing tickets. The code should be applied before checkout on the ticketing website http://events.ticketbooth.com.au/events/22970. Members are invited to the annual Annual General Meeting. Come along to hear about the Club's past 12 months, ask questions and elect Office Bearers and committee. You will be eligible for a discounted club membership fee if you pay on the night. You can use the courts for games once the meeting is done. Download the first notice here. Nominate for an official position or submit a motion for discussion by 15/03/2018. Download the second notice here. There are a few spots remaining so it's first in best dressed. Contact Simon as soon as possible if you wish to play. Download the entry form here. Reminder to all that there will be zero tolerance of alcohol, either from night before or consumed during the tournament as this is a club tournament with juniors taking part as well. If you plan to party the night before please be mindful of your limits to be fit for play the next day. 24th & 25th March 2018 . Entries close: Wednesday 21st March. 2018 sees another Masters Games being held in Alice Springs. The entry age has been lowered to 30+ to allow those younger, fit players to come and challenge especially in the Open and A Grade events. There are changes to the teams event to allow these younger players to join the golden oldies. Our Sturt Badminton Academy sessions held on Friday nights will be returning to Seymour College from start of term 1 with the first session being held on 2nd February. We do realise there are fewer courts than at Loreto so there may be some adjustments to the group breakdown but we will be reviewing how many of each age group turn up over first month or so and then will readjust to try and even out the numbers to ensure everyone gets a fair opportunity on court. We will also be having another session starting up at Seymour College on Thursday nights from 6:30-8:30pm. Keep tuned for notice in upcoming week for what is the plan for the session as it's in development at the moment but will hopefully lead to healthy growth in future competition players. Junior training camp to be held from Monday Jan 22nd to Thursday 25th at Badminton SA; 42 Rutland Avenue, Lockleys. The training camp is ideal for junior players aged 9-16 years old, focusing on doubles and mixed doubles. Under 13 & Under 17 Aged Titles to be held on Sunday February 4th 2018. We encourage all eligible players to ener the first junior tournament of the year. Apply for the Under 19 State Coach, Manager & Umpire positions. Closing date for applications is Monday 12th February. If you wish to take part please contact Simon or Paul by 27th November to register your interest. Community CPR-30 is a totally free, 30 minute session which teaches "compressions only" CPR and includes Automated External Defibrillator (AED) familiarisation and activation. By increasing Community engagement in bystander CPR, SA Ambulance Service aims to improve survivability for persons experiencing sudden “out of hospital” cardiac arrest. Thanks to the success of the previous Schools Tournaments this year, a third Schools Tournament has been scheduled - a fantastic opportunity for budding players to compete in a friendly environment. The Schools Tournament entry restricts players who have represented South Australia at a national junior carnival. Download the entry form for this tournament here. Entry forms can be printed or emailed back to Michelle Au, Junior Development Officer, Badminton SA at sabajdo@gmail.com - or via the Tournament Entry box located at Lockleys. One entry form per person. Deadline for entry is Monday November 20th. Contact Michelle Au with any questions. Expressions of interest are sought for the Senior State Squad from where the Senior State Team to compete in the 2018 Ede Clendinnen Shield and individuals events will be selected. The nationals will be held in Melbourne, Victoria from 25th Feb – 3rd March 2018. Please email your interest to badmintonsa@bigpond.com Only those who email their expressions of interest will be eligible to join the squad. Closing date for interest is the 20th November. · Tickets need to be purchased before November 19th 9:00 am for catering purposes. There are limited places. · No refunds will be given. You may sort this out between club members if you are unable to attend after purchasing your ticket. Download conditions of entry and entry form here. Applications for 2018 senior team coach, manager & umpire now open! Badminton SA are seeking a coach, manager and umpire for the senior state team. Please see flyer attached for details. Closing date for applications is Saturday 4th November. Coach and umpire MUST be accredited. We will be holding our end of year presentation luncheon on Sunday 19th of November. More details to follow soon. NOTE: Register your interest by Friday 11th August by emailing Paul Godden - goddenp@chariot.net.au. After a successful pilot run of the Advanced Player Development Program, a second round of the Advanced Player Development Program commences on Friday 18th August. Participants will be working together to train each other in a collaborative program with input and feedback from those who take part. Participants will have two week trial period before making full commitment. You must apply if you wish to take part - please register your interest by emailing Paul Godden. Successful applicants will be notified by start of the next week. NOTE: Entries close on Sunday August 13th. Shuttle Time course - Register your interest now! The Sturt Badminton Club will be conducting a BWF Shuttle Time Course on Fridays 21st July, 28th July and 4th August at Loreto College from 6:30 - 9:30 pm. The training course is aimed to help coach young children with ideas for different activities. The accreditation is helpful for obtaining paid coaching jobs at schools. Hoping those who help out at Loreto or those who have considered helping out but haven't been sure how to do so, will hopefully take part and get some new ideas of what to do. If you wish to take part please contact Paul Godden along with contact e-mail so that the course co-ordinator can get in contact with necessary information. Please note you need to be available for all three dates. You need to be a registered member of Badminton SA through the Club you are playing for if you want to play in a SABA teams competition. are now covered for personal injury insurance. qualify for discounted casual SABA court hire rates at Lockleys. must keep your personal and contact details up to date. Please email any changes to president@sturtbadmintonclub.org.au. The U19 State Team has been announced. The Under 19 State Team to compete in the CP Maddern and individual events has been announced. Congratulations to Sturt's Daniel Lee. Family, friends, fellow badminton players will be able to watch the team in action at the WA Satterley Hall in Lockleys from 8th - 16th July. On Friday 31st March the Club's AGM was held - thanks to all who attended! Retiring Treasurer Maureen Collins - presented with flowers and a gift basket by President Paul Godden. Thank you Maureen on behalf of all our members for your 35 years of representation on the Committee and active club membership. Congratulations to Tommy Fang on his 2017 U17 State Team selection - receiving a $25 voucher from Club President Paul Godden. Other club members also selected for the U17 State Team are: Celeste Jong, Charles Jong and Marcus Kha. Meng Fong 2016 award recipient is Ly Ming - the friendly face you see greeting people and collecting door fees on Friday nights at Sturt Badminton Academy sessions. Thank you Ly for your courtesy, assistance to the Club and its members, enthusiasm and dedication. Format: Two Divisions with teams of 3 organised by tournament organisers. Light supper provided during presentations. If you're able to help out on one or more Friday night sessions at Loretto it would be greatly appreciated as numbers are picking up so we need as many helpers as can make it. Contact Simon Yeo for details or just turn up. It's mad March on the badminton courts as well with a number of tournaments and competitions in the upcoming month. Download a copy of the 2017 Junior Tournaments here. The first Schools Tournament for 2017 is Sunday 5th March 2017, 9am – 6pm at WA Satterley Hall, 42 Rutland Avenue Lockleys. The Schools Tournament is open to U/14, U/16 & U/19 age categories with past & previous state team representatives ineligible to enter. The other junior tournament being held in March is the U/15 & U/19 State Championships. This tournament is open to all junior players, with what will be a high level of competition! Online entry & manual entry forms will be available at Lockleys. Olympian Leanne Choo will be our guest speaker. Come and see who (you ....?) has won Club awards! Sturt Badminton Club is subsidizing the event via room hire, awards and also meal price. NOTE: There is no separate Presentation Lunch in November 2016 - that will be replaced by the 35th Anniversary Lunch for 2016 only. Very few people represent Australia in badminton and we honour Leanne's achievements in doing just that for the second time - you made us proud in London and again in Rio! Unfortunately the Rio Olympics campaign is at an end but congratulations to Leanne Choo and her Mixed Doubles partner Robin Middleton. It's official - Congratulations to Leanne Choo on being selected in the Australian Olympic team! Watch the video on how Leanne and Robin's badminton mixed doubles partnership came to be. We are thrilled to see badminton coverage in our local media in the lead up to the Rio Olympics, and especially this recent Messenger Newspaper story on Leanne Choo. you are invited to attend the Sturt Badminton Club's 35th Anniversary Lunch on 25th of September, 2016. We invite all lifelong members, previous members, current members and their family. The event will be held at The Edinburgh Hotel, Mitcham: http://www.edinburgh.com.au/ on Sunday the 25th of September 2016. Commencing Friday 22nd April 2016 - Sturt is moving to Loreto College on Friday nights due to the unfortunate water damage to courts in the Seymour Sports Centre. Refer to our Venues page for more details. Adventure room is a fun 'real-life' escape room where teams are locked in a room with a mystery to solve. The team needs to work together, using the clue and objects in the room, to 'escape' in 60 minutes! Find the clues. solve the puzzles and ESCAPE! It's that simple! Our committee will organise you into groups for some friendly competition with other Sturt members to see who can escape faster! Team work is essential! The AGM - it's important. Make sure you come on 1st April 2016. As this year is our 35th anniversary we want to share the joy with as many members as possible. Come along to receive our 35th anniversary gift. Pay membership fees on the night. Positions are still available to join the committee so if you have some free time and want to contribute as a committee member then please nominate. Are you interested in participating in the 2016 Masters Games in Alice Springs from 8th to 15th October 2016? Download information here. Sturt Friday night sessions at Seymour need YOU to help out with junior player activities. Come and have fun. You could be helping future stars for our club or even a future Olympian - if we do not have members, parents or friends helping then the Club is limited in what it can offer. Contact Simon - venue@sturtbadmintonclub.org.au. Our greatest need is for Shuttle Feeders. Start straight away - we have prepared volunteer resources, provide training so that you can start immediately and need 2 hours of your time and enthusiasm for as many Friday nights as you wish to volunteer. We offer the opportunity for you to be connected to the Club and the wider community, contribute your experience and ideas, and be appreciated. If you can think of a Club member who displays some or all of the following qualities then please nominate them for this award - download the nomination form here and return it to any committee member no later than Friday 4th March 2016. Keep checking our Events and Latest News pages or facebook for more details. provide light refreshments after the games while the awards are worked out. The club has been able to organise with the bowling centre to get the best deal that they can offer which is two games for $15 per club member. Family are welcome to take part and enjoy the fun. Thanks and I hope everyone has a good time. At the end of every year the Sturt Badminton Club hold a lunch to celebrate the past year and the coming together of all players across the club. Whether you are in your first year of joining the club, or have been with the club for some time now, this event will provide a great to have everyone come together for an end of year celebration. There will be presentations and awards on the day. Please purchase tickets by 11 am 16th November (for catering purposes). There are limited places. No refunds will be given. You may sort this out between club members if you are unable to attend after purchasing your ticket. You will need to purchase your own drinks on the day. No BYO. There will be a 30 cent charge for each individual ticket that you purchase. Simon Yeo being presented with the Ken Hall Volunteers Award by Debbie Gutte (Ken's daughter) at the AGM. Well done Simon. • Assists with the running of all of our Tournaments throughout the year, which are the Sturt Champs, Sturt Handicap, Sturt Teams Event and the Sturt Junior Challenge. If you have entered this tournament please turn up on time THIS Sunday 25th October as need players to be there for the format to work smoothly. Mild themes, violence, coarse language and sexual references. Adam Sandler, Kevin James, Michelle Monaghan. Thanks for your support. Any questions, please send an email to Steph Jong at stephanie.jong@hotmail.com. The Sturt Badminton Club would like to advise that we have organised a celebration of Kevin's Badminton Life and we would like all past and present players to come and mingle and reminisce about their memories of Kevin. If anyone has any photos of Kevin there will be a pinup board available to display them,so please check your photo albums and bring them along as I am sure that everyone would like to see them. If you can please advise as many current/past players you know of that Kevin has helped or has known that would be greatly appreciated. It would be great if everyone could make it. No need to RSVP. Hope to see you all there, to pay your last respects to a man that did so much for the Sturt Badminton Club and also Badminton in SA in general. Kevin Conlon ------------ Passed away peacefully on August 26, 2015 aged 81. Kevin was a founder and a Life Member of the Sturt Badminton Club and will be sadly missed. Congratulations to Lee-Yen Khoo on reaching the final for the Womens Doubles event. She and partner Alice Wu (VIC) finished runners up to Joy Lai (VIC) and Grace Ngiam (QLD) 15-21 17-21. Lee-Yen also reached the Ladies Singles semi-finals and Mixed Doubles semi finals with partner Keith Edison (SA). Congratulations also to Lee-Yen as winner of the Joy Twining Trophy. The Joy Twining Trophy became connected with the CP Maddern Trophy in 1982. It is awarded to the player of the Championship who exhibits the highest standards of sportsmanship, personality, court demeanour, player ability, determination and appearance. Mrs Twining is the donor of the trophy. She was an outstanding player of South Australia, won three Australian singles and one ladies doubles title, and represented Australia in international events. She received a Medal in the Order of Australia (OAM) and a Meritorious Service Award (IBF) for services to badminton. In the 2015 Li-Ning CP Maddern Trophy the SA team won bronze, behind winners Victoria and runners-up NSW Thunder. Thanks to all who were able to make Friday night’s AGM, it was a great success! Congratulations to the winner of the Meng Fong Award - Richard Yin. We were also able to launch the new club shirt - thanks to the 2014 Committee for modelling it. We now have new Sub Committee Member, Natalie MacFarlan, joining our team. The second Notice of Annual general Meeting has been emailed to all members. You can download a copy here. The first Notice of Annual General Meeting has been emailed to all members. You can also download a copy here. - nominate for the Committee. - nominate a club member for the Meng Fong Award. You can download a nomination form here. The design for the new club shirt has been finalised - we are really happy with it and hope you are too! Send a message (via SMS or email) to Paul Godden indicating how many shirts you would like to order, what size (if he doesn't have it), and name format that would like on the shirt (ie initial first then surname or surname than initial). Please note that we are hoping players will wear the shirts while playing competition or at tournaments to show that they are representing Sturt, so names will need to abide by the BWF regulations. If you could please let Paul know as early as possible it would be great as hope to be able to get as many made and ready for distribution at the upcoming AGM on the 27th March if possible. 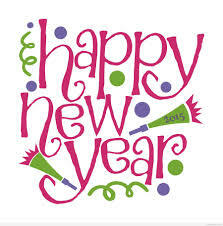 and wishing everyone a successful and happy new year. From December 1st to 13th the Club would like all members who intend to order a new Sturt shirt to check which size they will need to order by trying on sample shirts on one of the dates listed below. This is important, as we do not expect to be able to exchange for a different size after purchase so we want you to use this opportunity to check what size you need. Please note that the shirts available from December 1st to 13th are for sizing only and will not include the new design. Please make an effort to do this sooner rather than later as we only have the sample shirts for a short period of time. We are aiming to have club shirts ready for distribution at the 2015 Sturt AGM in March 2015, ready for the winter season. Don't forget if you want to reduce the cost you need to pay for the shirt you can sell some chocolates. If you sell 1 box you save $20.00 or if you sell 2 boxes you're entitled to a free shirt. That's a great incentive!! If you are interested see Paul or Pauline for a box. 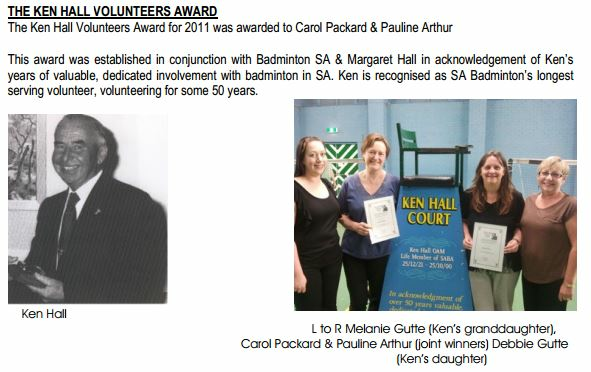 Congratulations to Paul Godden, President of Sturt Badminton Club, who was a worthy recipent of the Ken Hall Volunteers Award in recognition of his years of dedication and support of the sport and club. He received the award on 1st November 2014 at the SABA AGM where he was pleasantly surprised as he was not aware of his nomination. Paul has dedicated a lot of time to the sport including representing the state, coaching the juniors at Seymour week in, week out, and organising the teams ans supporting them across the grades. He does it all for the love of the sport and to give back to the sport. May we all look to him for inspiration and see what we can do to help the sport in whatever way we can. In 2013 Maureen Collins, Treasurer of Sturt Badminton Club, was presented with this award as was Pauline Arthur, Secretary of Sturt Badminton Club, in 2011 (see further down for more info). Need a hand using TryBooking? The Club has prepared a guide to finding and using the TryBooking website to purchase tickets to the Sturt Presentation Lunch. You can download it as a pdf here. At the end of every year Sturt Badminton Club holds a lunch to celebrate the year and the coming together of all players across the club. Whether you are a first timer to the club or have been in the club for some time now, it will be great to have everyone come together for an end of year celebration. There will be presentations and awards on the day. Please note that this year the club is trying something new and asking you all to pay online. In order to do that please read the information below about the event and then book online at: http://www.trybooking.com/GEYC. The payment process is secure and TryBooking does not store Credit Card numbers - only the last four digits of the Credit Card are kept for display purpose for the booking. • NO refunds will be given. You may sort this out between club members if you are unable to attend after purchasing your ticket. • You MUST print off and bring your ticket on the day to receive your meal. • You will need to purchase your own drinks on the day. No B.Y.O. • There will be a 30 cent charge for each individual ticket that you purchase. This year the Club is running a fun competition for the best badminton photo taken by a club member. The Sturt Committee will judge the winner and are hoping to see photos that capture badminton in a spectacular, energetic, humorous or visually appealing way. The winner will be announced at the Sturt Presentation Lunch on 23rd November 2014 and presented with a small prize. To enter the competition photos must be submitted by 5 pm 17th November 2014 to Andy Lo (Sturt Committee member) via PM or to andyhwl@gmail.com, You can submit a maximum of five (5) photos. You may wish to give the photo a title or caption, include when the photo was taken, where and who is in the shot. Good luck! Please come and support the efforts being put into organising these events. Hoping everyone who made it to the bowling had fun. There were some great performances along with some spectacular shots :) and the agonising misses :( but hopefully everyone had fun in the process. Full details are on our Results page. There was a good mixture of players from the different grades with some unexpected results. Thanks to all the players who umpired with a number doing multiple matches through the weekend including Duc Le, Anthony FE Tbb Chiem, Quoc Le, Paul Godden, Gabriel Lee to name a few. Thank you to Steph Jong and Michelle Au for manning the desk on Saturday night while Quan Ho & Ryan Diep did a great job on Sunday. Thanks also to: Pauline Arthur for organising the supper; Paul Godden for organising the draw and running the tournament superbly; to Maureen Collins and to Simon Yeo for collecting all the used shuttles and making sure the Social Centre was tidy before we left. Thanks to Koh Beng and Athletes Foot for donating the great prizes as well along with shuttles that were used during the tournament. Fundraising for Sturt Shirts - the boxes of chocolates have arrived! You have an opportunity to raise funds towards the cost of your Sturt shirt through selling boxes of chocolates. If you sell one box you get a credit of $20 towards your Sturt shirt and if you sell two boxes you get a FREE shirt. Any extra boxes you sell the additional proceeds will be used in a general pool of funds towards the set up cost of the shirts. Please return funds, collect new boxes or return unsold chocolates to the person you collected the chocolates from. We hope to be able to finalise the design soon. Sturt shirts are expected to be available at the beginning of Summer Season. Some of you may be aware of the club's intention of getting a new club shirt that can be worn with pride to show that you play for Sturt. We have sourced a company who is willing to get the shirts and put on our specified design for roughly $45 a shirt. The club will be subsidising a portion of the cost but had the idea of fund-raising towards making the shirt even more affordable for all players. If you have any suggestions for the design, please get in contact with Andy Lo but the final design will have to be approved by committee as it will be representing the club. So if you can please support this plan by either purchasing your chocolates from those selling or better still be willing to sell the chocolates for the club it would be greatly appreciated. Captains will be approached initially but all members are welcome to take part. Depending on the interest in first run will determine how we proceed and how much it will save individuals on purchasing shirts. All proceeds raised will go to the club’s already discounted price for the shirt.